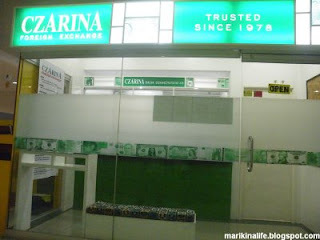 Czarina Foreign Exchange has been one of the longest money changers around the Metropolis. Since established in 1978, they've added several branches, including one in Hong Kong and in Dubai, United Arab Emirates. Here in the East, the closest Czarina branch to Marikina used to be their Q-Plaza branch in Cainta across Sta Lucia East. But now, for the Marikina-based, they've added a branch at Bluewave Marquinton. Czarina has one of the most competitive and convenient exchange rates available. Czarina Foreign Exchange is located on the 2nd floor of Bluewave Marquinton Mall right beside the PCSO Lotto outlet, Book Nook and the Globelines office. It would be better if u post ur contact number/s. Please check the grammar of the second paragraph. Out of curiosity, I checked if they have a website, and I was surprised that they do ! Rarely do money changers and pawnshops have websites. Unfortunately, it seems their last update was in 2004. Their newest branch in Marikina isn't even listed yet there. How sad. And so I think them having a realtime current exchange rate online is close to impossible right now. About the sour faces, I dunno if it's just them but I noticed that in other money changers as well, not just Czarina. I have a feeling they were given a directive not to be so sociable, approachable and smile due to the nature of their business being trading money in bulks with customers. May be it's just me. And lets do hope it's just me. hahahaha! palit ba sila ng argentine peso? checked on Czarina's website, mukhang updated naman ang foreign exchange rates nila kaya lang bakit kaya walang rate ang buying nila ng US $? ngpapalit po kayo ng egyptian pound?